That may be kind of like "Tallest Midget." But whatever. LIVE 105's Not So Silent Night (Fri 12/10) had not one, but TWO mashup rooms--both accessible only to VIPs, and thus a little sparsely attended (not to mention the distraction of the excellent rock show happening in the next room). But fine DJ sets put in by Earworm, Adrian & Mysterious D, and Go Home Productions. Huge thanks to them, and also thanks to the drunk girls who ignored Modest Mouse to dance to my set. NSSN was followed by the raucous after party at Club Six (no relation to Sixx Mixx), at which (for no reason other than I happened to show up at the right time) I was able to spin right before and right after Afrika Bambaataa. Then of course, Bootie followed on Saturday 12/11, and a good time was had by all. I'll see if me and Deidre can remember all the setlists so we can post them up here. Mostly what I remember is that Bizarre Light Triangle got the first good reaction it's gotten at a party in like 4 months. Above right: Dada, GHP, Mysterious D, Adrian, and below, and apparently asleep, the always-photogenic Party Ben. Photo by Lenlow. More pictures of Bootie right here. If I had known, I would have made it shorter. Not to seem unappreciative, because of course it's an honor, having an hour-long mix on my favorite radio station ever (sorry Rev 105)... But apparently they got it started a little late, and then cut off the last 5 minutes or so. That 5 minutes happened to be"Boulevard of Broken Dreams," which is currently sweeping the UK (by that I mean, in fact, not sweeping the UK, but I was hoping for that sweeping to get jump-started by XFM, and, er, guess there will be no sweeping). So, all you Londoners e-mailing me and asking "why did you end your mix so abruptly," er, that's why. In any event, approximately 90% of it was aired, and a big thanks to James Hyman for the opportunity, which of course made my whole year. (James has apologized profusely for the cutoff and says he'll play "Boulevard" some other time). Now can I please have asylum in your country? Well, when it rains it pours, and in an unexpected bid to beat XFM to the punch, the "Beeb" (ahem) played not one but two Party Ben Productions. First up, legendary DJ Judge Jules gave U2 vs. Way Out West, the Vertigo breaks mix a spin on Saturday night. Listen to his quick little backsell (minus a mention of my name of course) right here. Then, even more unexpectedly, on Monday 11/1, the decidedly tween-aimed late-morning show superstar Jo Whiley apparently had a wee mashup contest, whereby listeners called in to decide which one of three mashups would get played, and Boulevard of Broken Songs won that little contest. I don't have audio of that but people say it was very exciting. For a fey little anglophile like myself, raised to worship the amazing, government-sponsored (?!!) radio station at the center of music culture, this is somewhat overwhelming. But in lieu of doing a Halle Berry Oscar speech, I'll just say, "cool." PARTY BEN PRODUCTIONS USED AS INSPIRATION FOR TWO BOOTIE FLYERS IN A ROW! "Boule vard of Broken Songs"
No matter how much I would like to. Legendary bootleg clearinghouse boom selection has given me some props, which is pretty amazing for dorky old me, seeing as the site was one of the first places I found on the interweb for this whole mashy phenomenon. Before I found GYBO, even! So thanks to Dr. Boom. However, his remarks seem to link me to a bunch of great things about Club Bootie, including the dancers, the dressing up, the live mash-up band, and the amazing flyers--unfortunately I have nothing to do with any of those things. I'm just a stupid DJ in a black t-shirt! But, if people want to believe that some of Adrian and Mysterious D's fabulousness has rubbed off on me, I guess I should go with it. Thanx, Yahoo Web Hosting! You know the Sixx Mixx, it's that half-hour show I have on LIVE 105 FM radio station in San Francisco, Fridays 6-6:30pm. People often want copies of their own, to play at other times, times in their lives when they might feel sad, or mad. Well, now that Yahoo has like 40-tupled the amount of storage in their cheapo web plans, I can start sticking some up here. Currently four (4) Sixxa Mixxas are available for you, right now. If you aren't already too depressed, lumber on over to the Sixx Mixx page for the playlists and everything. FAITHLESS/GEORGE W MIX MAKING REPUBLICANS TREMBLE! It's the Fahrenheit 9/11 of bootleg remixes. Or not. Okay it was pretty obvious: put some George W. Bush speechifying over "Mass Destruction," and maybe add some echo. Now, finally, after like 7 different revisions, I've come up with something barely tolerable. It's Faithless "Mass Destruction" (Party Ben's George W. Mix). Republican morons all over the Midwest are totally voting for Kerry now. How could they resist the power of that triplet-time echo. PARTY BEN, MAKE UH PEEPUL, COME A GEDDUR! ...Yeah! First up thanks to DJ David X for throwing my sloppy Maps vs Bucci Bag [temporarily offline, sorry] into the mix on his Alternative Beat show on Sacramento's KWOD/106.5. 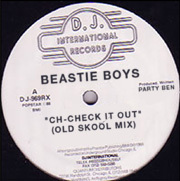 Big ups to DC101 in our nation's capitol for dropping the Ch-Check It Out Old Skool Mix into their new music show. Bitte, ditto, to Strictly Kev who slipped it into his Solid Steel mix, and huzzah to James Hyman at London Alternative XFM's "The Rinse" who opened his show with it late Friday night (8/6)! Thanks everyone, although I can't really take credit for the genius of Fast Eddie can I? U2 FAN SITE LEADS ATTACK ON PARTY BEN?! Don't hurt me The Edge! The U2 fan site AtU2.com has discovered my dopey little U2 vs. Janet Jackson mashup "Control Bloody Control," and links over to this very web page in a not-so-nice kind of way: "...you may not like this one..." and, worse: "Party Ben, who appears to be a DJ/remixer..." Appears?! That's exactly what I don't do! Anyway. U2 fans, if you're reading this: please don't be mad at me. I made this mashup with love. Love! You wanna see my well-worn vinyl copy of "War"? Wanna see my ticket stub from the Zooropa tour? Wanna see my pages and pages of secret love poems to Larry Mullen Jr.? "You drum/And you drum/But your hair/Still sticks up/When will you notice me???" ... you get the idea. I just can't win. In an otherwise perfec tly fine article about bootlegs and Bootie and whatnot, the writer gives me credit for Soulwax' s Nirvana vs. Destiny's Child "Smells Like Booty," and of course I go on and on about how great it is, making it look like not only am I taking credit for someone else's work but also that I really really love myself. Neither of which are true. Kudos anyway to Monique Beeler who came on out to Bootie for the article. I'll try and live this down. I'm like the Larry David of the bootleg scene--always the victim of some sort of misunderstanding that makes me look like a jerk. The difference is I don't have 200 million dollars from my successful sitcom. SF WEEKLY: PRO- OR ANTI-MASHUP? WE NEED TO KNOW! O contrarian alternative weeklies! What Gives? First, a lovely endorsement in "Night and Day" of Club Bootie (that mentioned my Beyonce vs. Alphaville track, but credited it to Adrian and D (see below, "Second Curse of Party Ben")). Then the always ornery Garrett Kamps writes this sloppy mash-up bash-fest of an article, managing to squeeze a boastful anti-bootleg quote out of the otherwise highly talented DJ Z-Trip, and basically concludes by saying that because mashups are done on computers, and not "live," they're bad. This starts a frantic thread- posting mania on both GYBO and Z-Trip's own website. People, please. Arguing about the relative legitimacy of art forms is so... French. It's like a cry for help. Because I'm a masochistic perfectionist and stuff, I always try to make something new for each time I spin at Club Bootie. Unfortunately, my desperate need to always fill the dancefloor and somehow prop up my fragile ego means that I invariably slap together two overused party tunes that I think the kids will like, rather than do something with artistic integrity or whatever. The last two Booties are no exception! At April's event, the dancing kids got to check out U2 vs. Janet Jackson "Control Bloody Control," which people liked okay; but when I played it in May, it nearly emptied the floor. However, the slapdash Rapture vs. Tiga "Hot Lovers" was a huge hands-in-the-air hootin-and-hollerin hit, which I think proves that Rapture song could have gone a lot farther if it wasn't for that screamy dude. Take note, disco-punkers. HOWARD STERN PLAYS "KEEP STERN ALIVE"
Or at least half of it. Funny story! Apparently my now-infamous mix found its way into the hands of Liquid Todd via the Crystal Method's management, who were apparently amused (and not litigious) enough to give people copies. Mr. Todd starts off his Solid State program on K-Rock with it, then gives it to Howard. Somewhere along the line, the phrase "Party Ben" seems to have gotten lost: Howard kept saying he thought the Crystal Method had done it themselves, and if they were making money, send some to him. This continues the Second Curse of Party Ben: I never seem to receive credit for anything I do. And Mr. Stern, if you're out there, I can assure you (and everyone else) that there has never been any revenue assosicated with anything I've ever done in my life. But I'm not bitter. Finally! Let's all think back to Winter, 2004. A simpler time, when people were saying crazy stuff, and it all sounded good mixed with The Crystal Method's "Keep Hope Alive." Let's remember the perennial favorite that started it all, "Keep Dean Alive!" (As seen on TV!) Plus, the bandwagon-jumping "Keep Hung Alive" (as mentioned obliquely on MTV.com!) Then, the overlooked gem "Keep Janet Alive!" (As mentioned absolutely nowhere!) And then, just when you thought the joke had already been pummeled beyond recognition, top it all off with "Keep Stern Alive," featuring everybody's favorite liberal talk radio host! They're all offline here at Partyben.com, but they live on in our memories, and on the iPods of the profoundly retarded. As always, I like to have something new for the kids when I spin at Club Bootie (America's Only All-Mashup Club TM) and while I had nothing quite as inspired as last month's "Bizarre Light Triangle," I finally got to use that Beyonce acapella I've had sitting around for months. (My attempt at marrying it to My Bloody Valentine's "Soon" never panned out.) Later I realized that I'm in a little bit of a rut, since I seem to be using New Wave megajams for all my work. But can I help it if I came of age in the '80s? Can I change the fact that the music that made the greatest impression on me was the music I heard whilst trapped in small-town Nebraska, feeling like a freak, desperate for glimmers of hope from the outside world?!?! No, goddammit, I can't! So, anyway, find these two new items under "New Items" at right, or go to the downloads page for more fun stuff. Boy that sure was fun wasn't it, that Howard Dean thing. He was gonna, like, be president and stuff. Anyway, thanks to the short-lived Dean Goes Nuts for the props. Today I was interviewed by Brian Banmiller of local Fox affiliate KTVU Channel 2 for a totally nonsensical piece about how the internet, which once served Howard Dean, now mocks him, and I guess my remix is an example of that. I said, "Huh??" Anyway. If you saw the piece on the 10 O'clock News, you might have noticed the Matt Gonzales for Mayor poster we snuck on the wall for the interview. Too little too late I guess. Also you noticed I have big bags under my eyes, and am a blathering idiot. All I have to say is: Brian Banmiller is gayer than Tom Ammiano. I should know, huh. Could it be that the Party Ben DJ Curse (Empire anyone?) has been lifted? The January 14 installment of America's First All-Bootleg Club (TM) Bootie was a great time, with Matty C, Princess Kennedy, DJ Mysterious D, and Adrian's all-mashup band wowing the nearly-packed house. Most surprisingly, there was no mass exodus from the dancefloor as Party Ben took to the CD decks, even as equipment problems knocked one set of speakers out of commission during "Hey Ya." Mad web props to A & D; check out snapshots of the evening on their website here. Also don't forget about the next Bootie coming up February 11th, featuring all the way from like Antarctica or something, DSICO That No-Talent Hack, who somehow managed to copyright a tagline that's much more applicable to me, before I got to it. Oh well.